On Friday afternoon (25th March 2016) I had organised with my good mate John VK5BJE to activate the Scott Creek Conservation Park (CP), VKFF-0788 and 5CP-207, with a view to field testing a Spiderbeams OCF dipole and also trying our luck on 2m. John and I had long since talked about trying 2m and some other bands during park activations, so we organised this day in advance. So after packing the 4WD to the brim, I headed over to Scott Creek to John’s home QTH. John was patiently and eagerly awaiting for me. A little more gear was placed into my vehicle and off we went to the Scott Creek CP. We were followed by John’s wife Jenny, who is involved with the Friends of the Park group for Scott Creek. They have an excellent website which can be located at……. The park is just a stone throw from John’s home, and about 20 km south east of Adelaide, in the Mount Lofty Ranges ‘Adelaide Hills’. Above:- Map showing the location of the Scott Creek Conservation Park. Image courtesy of Location SA Map Viewer. The park was gazetted as a Conservation Park in 1985. Prior to that most of the park was privately owned, with the South Australian State Government purchasing some of the land during the early 1970s, and then making a major acquisition in 1975. The Friends of the Park group has some excellent history on the park on their page. The park owes its name to a Mr Scott who in about 1847, brought a flock of sheep into the area and established a camp near a creek in the park which flows into the Onkaparinga River. The people of nearby Cherry Gardens referred to that locality as Scott’s Bottom, and the stream as Scott’s Creek. Between the 1850’s and the 1870’s the area was mined for copper and silver by the Almanda Silver Mining Association. Around 310 kilograms of silver was produced by the mine. In the lower section of the park you can view the ruins of the old silver mine including the old engine house, chimney, mine office, and a number of mine shafts. Scott Creek Conservation Park is about 750 hectares in size and contains an excellent example of the indigenous native vegetation of the Mount Lofty Ranges. Most of the terrain within the park is hilly and rugged. The scrub is very thick, and about 60 species of orchids can be found in the park. The park is home to numerous native animals including Southern Brown Bandicoot, Koala, Western Grey Kangaroo, Yellow-footed Antechinus, Common Ringtail Possum, Southern Bush Rat, and the Common Brush-tailed Possum. Over 28 species of birds have been recorded in the park. We headed along Longwood Road and then Mount Bold Road, until we reached gate 8. John and I have been to this park a number of times before and have activated from this specific location previously. There is a nice area here to park any vehicles off the road, and it is then just a short walk to a pedestrian entry gate which leads into the park. This is a high section of the park, with our operating spot being about 420 metres ASL, and just off the Cup Gum Track. Above:- Map showing the location of our operating spot in the park, about 420 metres ASL. Image courtesy of Location SA Map Viewer. We set up two operating stations, one for HF and the other for VHF. The HF station consisted of my Yaesu FT-857d, 40 watts, and a 40m/20m linked dipole, supported on a 7 metre telescopic heavy duty squid pole. I powered the radio with my 44 amp hour power pack. The VHF station consisted of John’s Yaesu FT-897, 20 watts, and a Cushcraft 3 element yagi mounted on a painters pole. John’s tx was powered by a LiFePO4 battery. After setting up both stations John and I set about field testing a Spiderbeam Off Centre Fed (OCF) dipole antenna. Rick DJ0IP had kindly supplied me with the antenna for free. The antenna is a Spiderbeam Aerial-51 Model 404-UL, which is a lightweight (weights 400 grams) 20m long OCF dipole. It has a balun which uses two matched toroidal transformers which are potted in epoxy. We then tried to tune up the antenna but experienced some difficulties with the tuner so did not get the antenna on air. However I am on holidays for a further 3 weeks so I will be heading out portable again and will try the antenna again, and will post a more detailed review. John and I headed to our respective stations and while John called CQ on 2m, I trolled across the 40m band and found Stef VK5HSX operating portable in the Hallet Cove Conservation Park, VKFF-0890 and 5CP-087. Stef had a very strong 5/9 signal coming in to Scott Creek from south of Adelaide at Hallet Cove. I then headed up the band to 7.150 and started calling CQ and this was responded to by Mick VK3PMG in Stawell in western Victoria who had a cracking 5/9 plus signal. It didn’t take long for the park hunters to find me and a mini pile up soon ensued with callers from VK3, VK4, and VK5. All signals were very strong with very little atmospheric noise on the band. And certainly no man made noise on the band. During the pile up, John came running over to me to advise that he had Gordon VK5GY on 2m SSB in the Bullock Hill Conservation Park. So I ran over to the 2m station whilst John took over the reigns on 40m. I was more than happy to be able to work Gordon as he was my very first ‘park to park’ contact on 2m SSB. I was then called by David VK5KC, followed by Phil VK5AKK. But despite a number of further CQ calls on 144.1 I had no further takers. I then handed back the 2m mantle to John and I headed back to 40m. I had just started calling CQ when a few bushwalkers came by my operating spot which was just off Cup Gum Track. Thank you to all those who patiently waited for me to come back on air. I had a chat with these 2 gentlemen and explained what John and I were doing, and all about the hobby of amateur radio. They seemed very interested. I then went back to 7.150 and called CQ and this was answered by Brian VK5FMID, followed by Don VK3MCK, and then Mike VK5FVSV. David VK5PL who was portable in the Hale Conservation Park then called in, and it was great to get another ‘park to park’ contact in the log. A few QSOs later I was called by Gordon VK5GY in Bullock Hill CP, for my third park to park contact for the activation on 40m, and fourth for the activation in total. I continued to work stations all across Australia, including Mike VK6MB in Western Australia (5/8 sent and 5/6 received). It was at this time that Peter VK5PM arrived at the park. Peter had called me earlier in the day asking if he could pop out to check out our portable set up. Peter is very keen to take up portable activating. When things slowed down a little I spoke with Peter VK5PET and Rick VK5FGFK in the nearby Mark Oliphant Conservation Park, on 2m FM on the Yaesu VX6R handheld. This wa say first ever ‘park to park’ contact on 2m FM. Only something small I know, but another milestone and something different. John and Peter also spoke with Peter and Rick. Time was starting to push on a little and it was now just after 5.00 p.m. John had to get up early the next morning and had a drive ahead of him, so John started packing up his 2m station. We lowered the squid pole and erected a 6m dipole and started calling CQ on 52.2. Sadly, our only taker was David VK5KC. John and Jenny, and Peter then left the park. I replaced the 6m antenna with the 20m/40m linked dipole and headed for the 20m band hoping to get some DX in the log. Prior to calling CQ, I found Phil VK6ADF on 14.310 in the Drovers Cave National Park VKFF-0146. After working Phil I then went down to 14.305 and started calling CQ and this was answered by Al VK7AN, followed by Steve VK4KUS and then Ted VK6NTE & Ray VK4NH/6. This was followed by the first DX for the day on 20m Max IK1GPG. 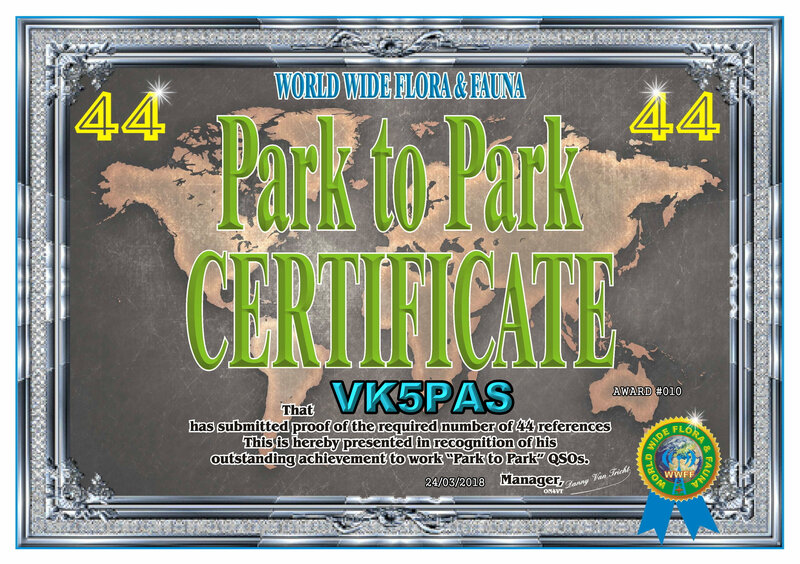 Sadly I only worked a further 4 DX stations (Italy, Japan, and Spain), along with a number of VK’s (VK2, VK4, and VK6). This included my good mate Ted VK6NTE and Ray VK4NH/6 (staying with Ted), and Jonathan VK6JON mobile. I decided to take a break from operating and went for a walk along the Cup Gum Track for about 1.5 km until I reached a clearing where you are rewarded with some amazing views of the surrounding countryside. The sun was just setting, so there was a nice orange glow off the gum trees in the park. I returned back to my operating spot, and prior to heading back to 40m, I had a glance across the 20m band and found it to be fairly quiet, with very little DX. But I did find Bill KE0HWZ in Colorado calling CQ on 14.229 (5/9 both ways). Bill was operating remote from Texas. But that was the extent of the DX. So I headed back to 40m and started calling CQ on 7.135 and this was answered by Steve VK5FSPJ who was operating portable from his backyard, followed by Steve VK7FTAS, and then Ian VK5IS. It was pleasing to hear a steady flow of callers again, with conditions being very good. Callers on 40m were from VK2, VK3, VK4, VK5, VK6 and New Zealand. This included Ken ZL4KD, the ZLFF co-ordinator. After working a total of 37 stations, I had a tune across the band and found Phil VK6ADF again, in VKFF-0146, with an equally good signal on 40m, as he had on 20m. It was starting to get very cold with the temperature dropping down to 8 degrees C. Local South Australian time was 8.40 p.m. (1020 UTC), so I headed to 7.130 and booked in to the 7130 DX Net. I worked Carsten VK6PCB who was portable and QRP, William FO5JV and Paul VK7CC. At around 9.15 p.m. local time I packed up the gear and headed home. It was a slow drive home avoiding all the kangaroos. For me, this was a very enjoyable activation. I had a total of 102 stations in the log, including eight ‘park to park’ contacts. That included some 2m contacts and a 6m contact, and the company of John and Peter. John’s most distant contact of the day was with Bill VK3LY in Nhill in western Victoria, and a number of amateurs in the South East of South Australia. I think I have been bitten by the 2m bug and I will definitely be trying some more 2m action this year during my park activations. Here’s my latest DLFF award certificate from Germany, for working 14 different DLFF reference areas. Many thanks to Friedrich, DL4BBH, the DLFF Award Manager. I qualified for the latest VKFF Hunter Honour Roll certificate yesterday, after getting over the line as a Hunter for working 375 different VKFF reference areas for the World Wide Flora Fauna (WWFF) program.